I’m always looking for ways to burn calories. (Running after kids only gets you so many burnt calories.) Going to the gym may be for some people, but I just can’t take the time to drive there and back often enough. 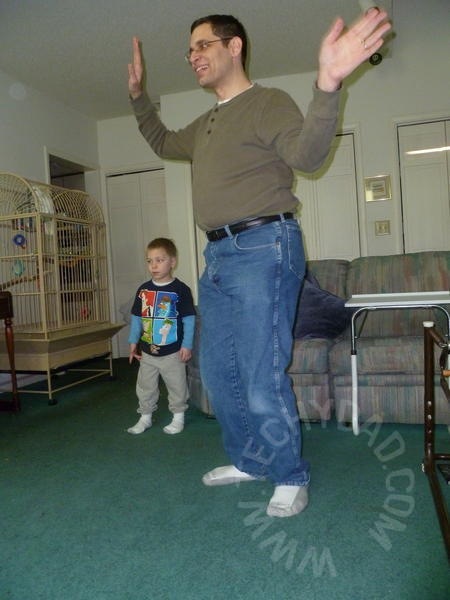 Any workout I do needs to be able to be able to be done from the home. Preferably during down time when the kids are asleep or otherwise occupied. For this reason, I love the latest generation of workout video games. Don’t let the "video game" name confuse you: these suckers can really make you feel the burn. 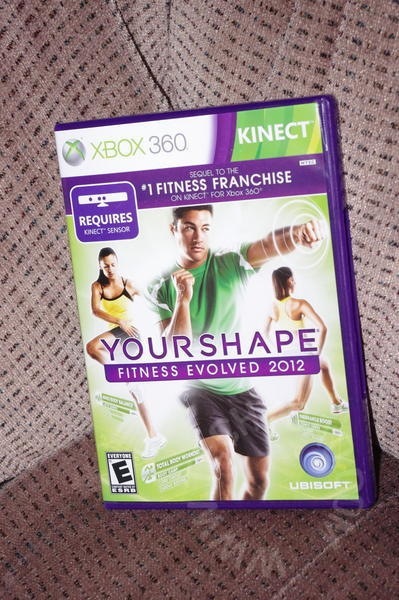 During the next five weeks, I’ll be posting my progress with Ubisoft’s Your Shape Fitness Evolved for the XBox 360. My goal will be to workout 3 times a week and burn at least 150 calories per session. After this, I tried Stack ‘Em Up: Hard, a balance game where you need to hold up a platform to catch falling blocks, to burn 4 calories. 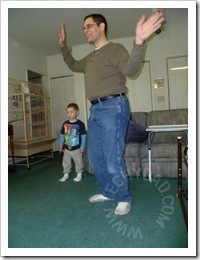 Then, I played Jump Rope: Easy (exactly what it sounds like) for 19 calories. Next, Wall Breaker: Medium (where you punch/kick to break bricks hovering in front of you). This one really helped me work up a sweat and scored 23 calories. After this was Juggle It which is kind of like a virtual hacky sack game (only with a ball). This surprised me and burned 15 calories. I didn’t think it would burn that many. Finally, I played Stomp It: Easy (where you need to stomp panels "in front" of you to the music) for 10 calories and Wall Breaker: Easy for 7. Total calories burned in this session: 152. The next session, I tried Pump It (where you flap your arms and bend your knees to inflate and then pop a ball) for 26 calories, Kick It (a soccer goal shooting game) for 19 calories, Hurricane (where you roll your arms around in circles to levitate some balls) for 19 calories, Stack It: Medium for 4 calories, Wall Breaker: Hard for 23 calories and Run the World: New York 5th Avenue for 70 calories. Total calories burned: 161. I was going to have a third session, but life intervened. And by life, I mean JSL got sick and I had to tend to him instead of working out. I do plan on doing three workouts for next weeks’ installment. You could win a copy of Your Shape Fitness Evolved. Simply post a comment to this blog post. When my five week series is finished, one commenter from across the five posts will win a copy of the game from Ubisoft. Disclaimer: I was given a copy of Your Shape Fitness Evolved by Ubisoft and financially compensated for this Clever Girls Collective, Inc. campaign. In addition, I was loaned an XBox 360 and Kinect for the duration of the campaign. The opinions expressed above, however, are my own. Great post and I too am a newbie to this workout video game. 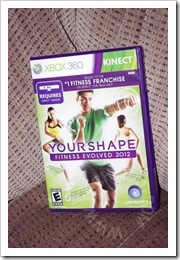 I got my Xbox Kinect bundle in Nov ’11 which came with the original YSFE not the 2012 version so not so up to date with the workouts/games that you mention in your post. I love the sound of Run The World and wish I had the newer version of the game. It’s still great though especially when teamed up with #YSC to keep track of goals and challenges. ps I never realised how much hard work burning 50 calories would be but well worth the effort! Working out in jeans?! I love how you can burn calories and have fun at the same time. I love that it shows you how many calories you burned since usually when I do a workout at home I have no idea. I found the original version tracked your body much better than other fitness programs out there – I’m sure this new version does the same! I’m excited to read about what new stuff is getting included in 2012. I don’t think there’s a Hu-La-La in my old version! It looks like some fantastic exercises to burn calories!